Samuel Beckett came into the world on 13 April 1906. Not only was it a Friday the 13th, it was also a Good Friday, the Friday before Easter Sunday, on which the Christian Church commemorates the Crucifixion of Jesus at Calvary. To the superstitiously-minded, any life begun under such ill-fated stars would seem destined for disaster. Throughout his career, Beckett kept thinking back to the unfortunate circumstances of his nativity and the future it seemed to hold. When Judith Schmidt – assistant to American publisher Barney Rosset of Grove Press, New York – wished him many happy returns on 13 April 1962, joking about it being a Friday, he wrote: ‘Very touched by your card and remembrance. I was born on Good Friday 13th, so can’t share your high opinion of the conjunction. And yet when I have the courage to take a quick look back I can see that the miracles haven’t been wanting and that but for them it’s in the better place I’d be for this long time’. On his 56th birthday, Beckett was an established author, but fourteen years earlier things were different. After encircling the date, he also adorned it with a doodle of the Holy Cross, thus invoking the death of Christ, even though it was not Good Friday but an ordinary Tuesday. Still, the allusion is fitting, given the uncertainty of his switch to French as a language of composition – having failed to make a name for himself in his mother tongue – and the story of the two thieves allegedly crucified alongside Christ, which Beckett had a fondness for. Although he knew it from the Bible, he particularly remembered it in the phrasing of Saint Augustine, as he told Harold Hobson during a 1956 interview: ‘“Do not despair, one of the thieves was saved. Do not presume, one of the thieves was damned.” That sentence has a wonderful shape. It is the shape that matters’. Whether prompted by the occasion of his birthday or not, Beckett comes back to the story later on in Malone Dies, when the protagonist of the novel despairs of ever finishing the list with his possessions before death claims him: ‘For why be discouraged, one of the thieves was saved, that is a generous percentage’. Taking a cue from Malone, interpreting the parable as neither a message of hope nor of despair, Beckett pushed on, knowing there was a fifty-fifty chance of success in the project he had begun. After Malone Dies, Beckett finished a play to take his mind off the ‘awful prose’ he was writing. Early on in the manuscript of Waiting for Godot, Vladimir also mentions the two thieves to his friend, Estragon, using the ‘reasonable percentage’ as proof that Godot might still show up. If the story could be interpreted as a cause for optimism – or against negativism – in Malone Dies, Beckett deflates that possibility in Godot. Vladimir is quick to point out the contradictions between the accounts of the Four Evangelists, Luke being the only one to chronicle the saved thief. Beckett puts it most poignantly in his own English translation: ‘one of the four says that one of the two was saved’. It is no small irony that the play which made Beckett’s career takes the bleakest approach to the story, even though it is the most honest and philologically correct. His going against such odds makes Beckett’s work, as well as his decision to write in French, appear all the more courageous, and one suspects he took heart from Estragon’s matter-of-fact conclusion about the Four Evangelists: ‘Well? They don’t agree, and that’s all there is to it’. 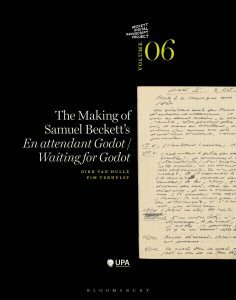 The Beckett Digital Manuscript Project, a collaboration between Bloomsbury, the Centre for Manuscript Genetics, the Beckett International Foundation and the Harry Ransom Humanities Research Centre, was awarded the 2018 MLA Prize for a Bibliography, Archive, or Digital Project.